Well aren't we just a bit excited! Carnamah, our society and our website are featured over a two-page spread in the November-December 2011 issue of Inside History magazine. 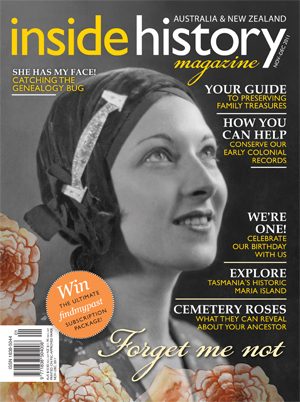 Inside History is an Australian and New Zealand publication for those interested in genealogy, history and heritage. "Calling Carnamah home" can be found on pages 28 and 29 of Issue#7. Aside from our devotion to the Carnamah spread there's another 74 pages of wonderful features and content. We'd like to thank Inside History for the wonderful feature on Carnamah. We're very honoured to appear in their beautifully produced magazine and even more so to be included in the issue that marks their first birthday. To find out more about the magazine or to order a copy online take a look at their website or to get a copy at a newsagent you can find one near you in their list of stockists. Well done you! Fame at last! Maybe you will get more follower once the article has appeared. Hi Andrew, great to see you are still doing wonderful things connected with the Carnamah Museum. I met you in 2008, we did some of the Museum Studies workshops at the same time. Thank you Catherine, Maree and Inside History!! We do have a few more blog followers now Catherine, although most people seem to check our blog via Facebook, Twitter or our website. Many thanks Maree - great to see you on here! Thankyou Andrew for the amazing effort and passion that you put into this website and for your obvious love and devotion to Carnamah. I am absolutely proud to call myself, well almost a local, I guess growing up in Three Springs qualifies me somewhat. I am also so very grateful that I have now brought a home here in Carnamah of which I most likely will forever call home. I am also very proud that my home has deep etchings within the history of Carnamah originating back to aprox 1932 of which was known as the Browns Boarding House. I love the community and the pioneering spirt of which Carnamah has never seemed to have lost, its just such a great place to live. Many thanks Roxy. Carnamah is indeed a great place to which I'm sure I'll forever have a strong connection to. It was a privlidge to spend my childhood and early adulthood there, and it's an honour to chip away on its history!